Allett Mowers has launched its search to find the most creative grass stripes and patterns in the world! The quintessentially British striped lawn is idealised across the world and, in celebration of this, Allett Mowers has opened the competition internationally. Allett Mowers is a leading manufacturer of reel, walk-behind mowers – the ultimate tool for creating perfect stripes. The first Allett mower was launched in 1965 and the brand has since firmly established itself as being synonymous with creating stripes on lawns and sports grounds around the world. The 2016 International Creative Lawn Stripes Competition encourages anyone with a flair for creativity and pride in their turf to enter and compete for the title, creating the most aesthetically pleasing striped turf in the world. The competition will be judged by Simon Bagnall, Head of Gardens and Grounds at Worcester College,UK responsible for its stunning grounds. The competition will run again next year (2017). 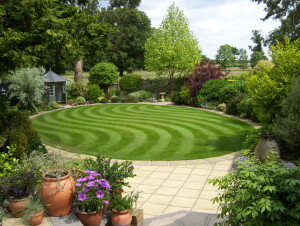 Find a video on how to create a beautifully striped lawn below. To enter the their competition entrants simply have to email a photograph of their creation to sales@allett.co.uk, along with their name and full address. The competition will close at midnight GMT on the 31st August 2016.